Having to appear in court is not a pleasant thought. The courtroom can be an intimidating place and can make victims feel unwelcome. But, if you have to go, familiarizing yourself with the rules and etiquette will help make it a smooth event. The Canadian court system is based on hundreds of years of tradition. Everyday behaviour, which is acceptable in the outside world, is often times not acceptable in a courtroom. Unfortunately, common sense will not always help you figure out what goes and doesn’t go inside court. Following is a list of some of the things you should know for court. Punctuality: If your notice says be in court by nine o’clock then, unless your lawyer has told you otherwise, be in court by nine o’clock. The truth is that you may have to wait several hours before you are dealt with. Typically, people represented by lawyers are dealt with first and then those without lawyers are dealt with in alphabetical order. However, sometimes there may be a short court list, resulting in your name being called early. If you’re not there, a bench warrant for you arrest could be issued. Searches: Many court houses are now equipped with metal detectors and security staff. You will be searched, much like at the airport. Do not bring pocket-knives, lighters, or anything else that may be construed as a weapon to court. Court lists: If you check the court list and can’t find your name, this doesn’t mean that you can leave. If you do, there may be a bench warrant issued for your arrest. Check with the court clerk’s office. They will be able to type your name into their computer system and let you know when and where you have to appear. Food: Do not eat, drink, or chew gum in court. If you are caught doing so, you will be asked to leave the courtroom. Head gear: You are not permitted to wear hats and sunglasses inside the courtroom. The one exception is head ware for religious purposes. Entertainment: Sitting in a courtroom waiting to be dealt with can be a long and boring experience. Nonetheless, you cannot choose to entertain yourself by reading, talking, listening to a Walkman, cuddling with a loved one, or sleeping. If you are caught engaging in these activities, you may be asked to leave the courtroom. Cell phones and pagers: All cell phones and paging devices must be turned off before entering the courtroom. Intoxication: As obvious as it sounds, do not come to court drunk or high. 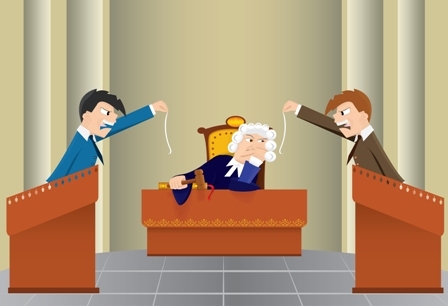 Small children: A courtroom is really no place for a small child. If the child disturbs the courtroom proceedings with noise, you will be asked to leave the courtroom. If possible, make arrangements to leave the child at home or bring someone who can wait with the child outside the courtroom. If you must bring a small child, try to speak with either the Crown, the duty counsel, or another court official to see if you can get dealt with first. You will probably be able to garner some sympathy. Standing: Standing in the body of the courtroom is generally not permitted. This usually occurs when there is a shortage of seating. Those standing are usually asked to wait outside and come back when paged. It is best to arrive early and get a seat. Dress: Dress appropriately for court. Casual clothes that you might wear to the office are acceptable in assignment or set date court. If you are going to court to plead guilty or for trial, then formal business attire is recommended as more appropriate. Addressing the court: When your name is called, proceed to the front of the court. The person on the bench will usually be wearing a black robe. If he or she is wearing a green sachet across the front then he or she is a Justice of The Peace and must be addressed as "Your Worship". If the person is wearing a red sachet across the front of his or her robe, then he or she is a judge and must be addressed as "Your Honour". When responding to questions, you must answer with words. Do not nod your head or say "umm hmm". The court reporter must transcribe everything and cannot record physical gestures or sounds that are not words. Before leaving, make sure the judge or Justice of the Peace is finished talking to you. Also, make sure you know your next date to return to court.